I went into this book not knowing what to think. I had read “Everything, Everything” by Nicola Yoon and absolutely loved it! My opinion of her debut novel was so high that I rea anything could surpass, or even come close to how I felt about the first. 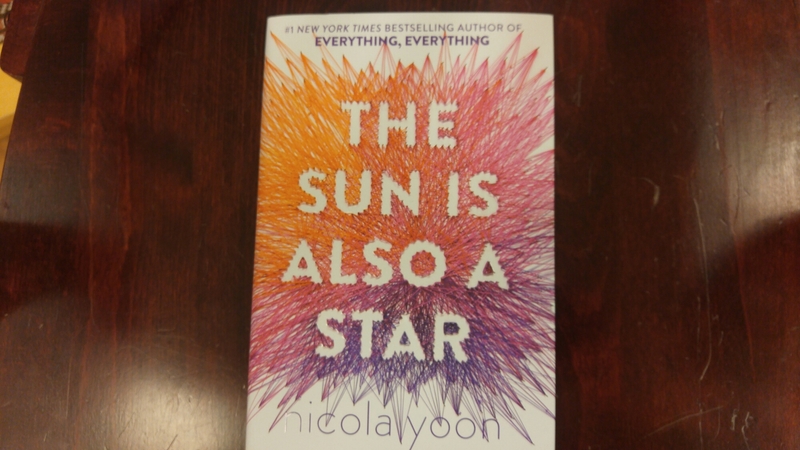 While I will admit I do love Everything, Everything more, “The Sun Is Also A Star” came insanely close. I personally found it hard to relate to Natasha. She did things I never would have done and she held back on saying things that I would have divulged much earlier on. I feel like she was mean when she didn’t need to be, and her pessimistic attitude rubbed me the wrong way. I did love when she was outspoken! Tasha is a strong and opinionated young woman who does not give up easily, and I admire that. I found myself relating much more to Daniel! Daniel is an optimistic dreamer. He’s the nice guy who wants to make others happy. Oh, and the funny bits!! Actual laugh out loud moments! Two of my absolute favorites (without spoiling anything of course) are 1. Natasha singing Karaoke and 2. Daniels dad and brother meeting Tasha for the first time. I just couldn’t stop laughing! I’m not sure whether it’s because that’s just what I do in awkward situations…but these moments were highly relatable and incredibly funny moments. As funny as these moments were, there were moments that were equally heartbreaking as well. With heavy subjects such as Racism, stereotypes, suicide, deportation, first loves and first heartbreaks, this story will give you lots to think about. A wonderful contemporary romance with some top notch diverse characters! After spending less than one day with Natasha and Daniel, they will seem like old friends. An anxiety disorder disrupts fourteen-year-old Audrey’s daily life. She has been making slow but steady progress with Dr. Sarah, but when Audrey meets Linus, her brother’s gaming teammate, she is energized. She connects with him. Audrey can talk through her fears with Linus in a way she’s never been able to do with anyone before. As their friendship deepens and her recovery gains momentum, a sweet romantic connection develops, one that helps not just Audrey but also her entire family. Suspense, secrets and thrilling action from the pen of J.K. Rowling ensure an electrifying adventure that is impossible to put down. Find out what I thought about week 5 of the #potterspeedread !! What did you think?!? Anna is looking forward to her senior year in Atlanta, where she has a great job, a loyal best friend, and a crush on the verge of becoming more. Which is why she is less than thrilled about being shipped off to boarding school in Paris–until she meets Étienne St. Clair. Smart, charming, beautiful, Étienne has it all…including a serious girlfriend. Virals by Kathy Reichs and Brendan Reichs ! Tory Brennan, niece of acclaimed forensic anthropologist Temperance Brennan (of the Bones novels and hit TV show), is the leader of a ragtag band of teenage “sci-philes” who live on a secluded island off the coast of South Carolina. When the group rescues a dog caged for medical testing on a nearby island, they are exposed to an experimental strain of canine parvovirus that changes their lives forever. As the friends discover their heightened senses and animal-quick reflexes, they must combine their scientific curiosity with their newfound physical gifts to solve a cold-case murder that has suddenly become very hot if they can stay alive long enough to catch the killer’s scent. Fortunately, they are now more than friends. They’re a pack. They are Virals. Every year, Blue Sargent stands next to her clairvoyant mother as the soon-to-be dead walk past. Blue never sees them–until this year, when a boy emerges from the dark and speaks to her. His name is Gansey, a rich student at Aglionby, the local private school. Blue has a policy of staying away from Aglionby boys. Known as Raven Boys, they can only mean trouble. But Blue is drawn to Gansey, in a way she can’t entirely explain. He is on a quest that has encompassed three other Raven Boys: Adam, the scholarship student who resents the privilege around him; Ronan, the fierce soul whose emotions range from anger to despair; and Noah, the taciturn watcher who notices many things but says very little. For as long as she can remember, Blue has been warned that she will cause her true love to die. She doesn’t believe in true love, and never thought this would be a problem. But as her life becomes caught up in the strange and sinister world of the Raven Boys, she’s not so sure anymore. Hey guys!! I’m just trying something new! I want to start making vlogs, but I don’t want to neglect the website! Please let me know what you think! About the post, the video, and the book if you’ve read it!! My TBR pile is out of control!! Although books are my happy place, currently my TBR pile has been a major source of anxiety. I know that I now own enough books to fuel my reading habit for years to come. This does not stop me from buying more. I know where to find the good book sales! I try to stay away, but I keep getting sucked back in. Where else can you find hours of entertainment for $5.99…how could you pass that up?? There are so many awesome books coming out all the time! I plan to read so many of them immediately, and then somehow they get pushed further down the TBR list. I also moderate a book club once a month, so there is no getting around that inevitable purchase. I know what you are all thinking! Borrow it from the library. Well, I simply cannot. I have this uncontrollable urge to own the books I read. I used to go to the library all the time, but I just ended up buying the books I liked anyway, and there are very, very few books that I dont like at least a little. I like knowing I can pick up a title at any given time and re-read! Also, I do lend out books to trusted friends so they can experience and share feelings as well! And I know what you are thinking now! Digital books Lindsey! They take up no room and they are much less expensive! Well, friends, e-books are just not for me. I have tried them. It’s not like I’m not even going to give them a chance. I own 2 e-readers, but absolutely nothing beats curling up on the couch with a hot cup of tea and an actual, physical book in my lap. I love the way they smell! I love the way the book spine feels in my hand! I love the way they look displayed on my many, and multiplying, shelves! However, the problem is not running out of space for my many books. Well, it kind of is. It will be. But I am prepared to deal with that problem. The problem is the anxiety I feel when I look at all the books and realize that I cannot speed read and I have to do grown up things like work and sleep. The desire to read all of the books at once is overwhelming. I almost always have an overly ambitious monthly TBR pile. I usually only accomplish about 1/3 if I’m lucky. I just ALWAYS get WAY too EXCITED!!! There are so many epic sounding, potentially life altering stories to discover!!! I am going to be moving soon! Which means that I have to re-locate my books! Sooo, I’m going to try out the whole dividing books by color thing. Worst case scenario I go crazy for a little while and then I put them back in the obsessive order I know and love. I’ll let you know how it goes!! I want to know what book stressors you are facing! Also, do you divide your books into categories? Which ones? If you're not having fun…you're not reading the right book!! Let me help you choose the right one! Would you like to be notified when I post something new? Follow me here! Enter your email address to follow The Picky Pages Project and receive notifications of new posts by email.